at the Nyack Public Library from 1 – 3 p.m. on Saturday, February 25th 2012. How it’s Irish: She will tell Irish Stories to kick-off the St. Patrick’s Day season. And one of them involves her father John Molloy, and a well known Dublin artifact! Then I sit back and wait for a fascinating story. “I went like a rabbit up them steps,” a woman said at a coffee shop in the Dublin Airport. 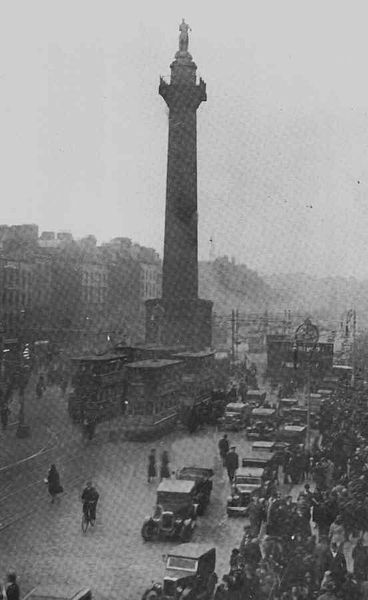 Nelson’s Pillar, a famous Dublin landmark and a tribute to the eponymous British naval hero, towered over O’Connell Street for 158 years. Early one Tuesday morning in 1966, the IRA–it is believed–laced the Pillar with dynamite and blew it up. Cleary’s clock stopped at 1:31 a.m. Portland stone, Wicklow granite, and bomb mist filled the streets. I’ve heard that a gang of actors and musicians were hanging out in Groome’s Hotel across the road from the Pillar. My father–John Molloy, a well-known comedian of the era–just happened to be among those leaning on the bar rail that night. Everyone was waiting for the explosion. They all knew it was going to happen. One young boy was shaken awake by his father who stood him in his bedroom window-well so he could watch Lord Nelson fall. At 1:31 a.m., Nelson did. 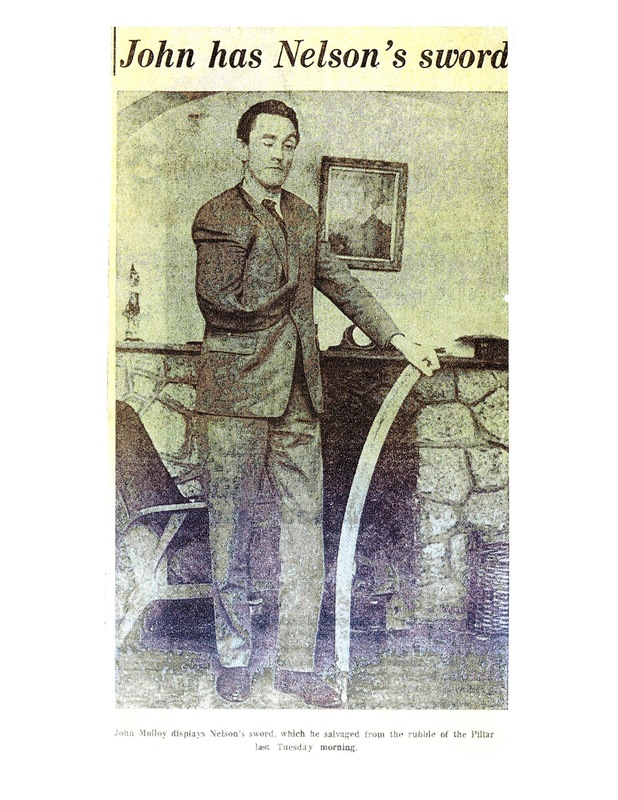 My father dug Nelson’s sword out of the rubble and brought it home. He’d been a Royal Navy man in the Second World War, and felt justified in taking it as a souvenir. He was photographed with it–great publicity for his show at the Gate Theatre—and it lived on our fireplace mantle for years. He also claimed that he’d packed Nelson’s head in the boot of a taxi, but that the Corporation wanted the head and took it away from him. My father was a fabulist, which is a polite way of saying that the truth never stopped him from telling a good story. Nowadays I’m suspicious about his version of that night, or at least certain parts of it. 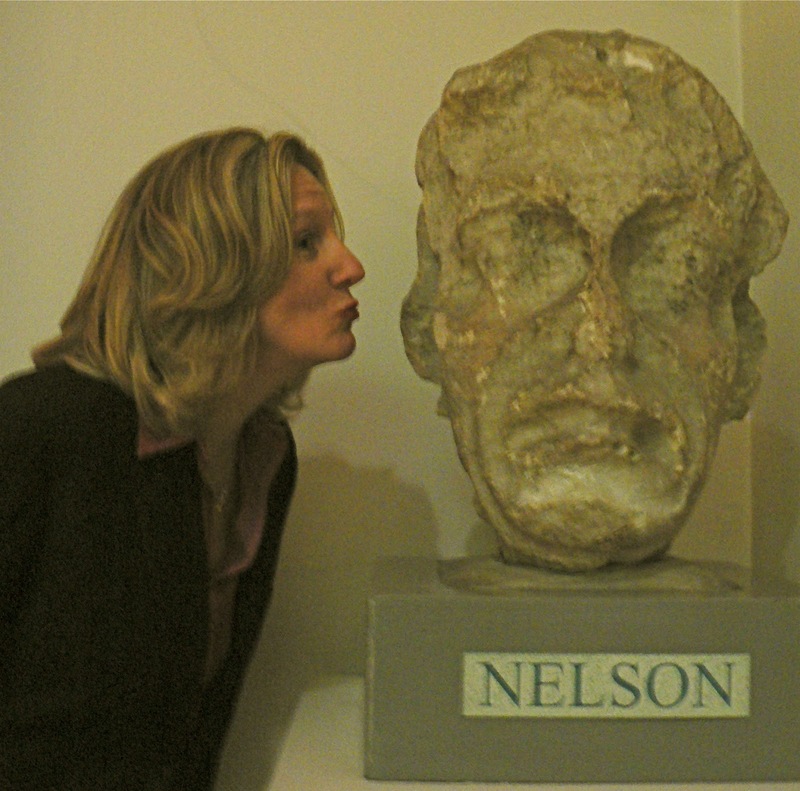 Nelson’s head, for instance. The Dublin City Library and Archive had to reinforce the floor to accommodate the weight of Nelson’s pate. How could one lethally skinny actor load the back of a cab with a ton-and-a-half of Portland stone? The Pillar’s been gone for ages now. The Dublin of which the Pillar was such a part is gone, too. Only stories and memories remain. I’ve got my own version of that night which you can watch on the YouTube below. Nyack, NY 10960 on Saturday February 25th from 1 – 3pm. And if you’ve been up the Pillar, swing by the library and tell me about it. I do love a good story. A good story, as any Irish woman knows, is worth it’s weight in Portland Stone. Honor Molloy is a Dublin-born storyteller who lives in Brooklyn.